It’s easy to mess up your dog training or puppy training and end up with a dog behaviour problem. Caring owners, with the best of intentions, accidentally make problems worse all the time. That’s such a shame because it’s so easily avoided. The good news is that it’s easy if you have an understanding of how dogs think. You just need the knowledge and a little patience. I’ve seen some amazing transformations in dog behaviour that owners have brought about with a little help from a professional dog trainer or dog behaviourist (Because owners – not me – are the ones doing the dog training every day). Rewarding Bad Behaviour By Mistake. It happens all the time. You come home from work and Fido jumps up. You fuss him and tell him ‘good boy’, almost before you’re in the house. Fido thinks “Ah-ha. Jumping up gets attention. I will try that more often”. Before you know it, Fido looks like a lunatic with a pogo stick every time someone comes to visit. Sound familiar..? The moral: Don’t reward unwanted behaviour and bear in mind that ‘reward’ means anything pleasurable for Fido – Fuss, attention, play, treats etc. Incidentally, rewarding fearful reactions by cuddling the dog and stroking them can intensify the reaction. It’s human nature to reassure, but it’s not natural for dogs. Talking Too Much. I talk a lot, but mainly to people! If you watch me communicating with dogs you’ll see I don’t talk much at all. Talking is more of a human thing. When we’re not understood, we rephrase things or change our emphasis. If you ask the dog to sit and it doesn’t work, then changing the tone of voice and even the words in an attempt to help Fido to understand won’t work. Invariably it confuses him. You know the kind of thing, you hear it every day in the park: “Sit.. sit.. siiit.. siddown.. sit.. Fido sit.. WILL YOU SIT DOWN! !” Add to that the fact that we usually get more stressed and frantic the more we repeat ourselves and you have a recipe for a ‘deaf’ dog. Good leaders are always calm and assertive, never frantic. One good clear command, always the same word, is worth five bad ones every time. Try it! Being Inconsistent. Dog trainers are always harping on about this one but it’s a big deal. There’s no better way to slow down your dog’s understanding than to be inconsistent. Think of it from your dog’s point of view: “I jump up on the sofa, they make me get off; I try again, they make me get off; I try once more, they mutter something but I get to stay” Then ten minutes later: “I jump up on the sofa, they make me get off again. Humans are weird and I’m confused but it looks like persistence pays off so I’ll keep trying”. Actually I’m not so sure that dogs think quite like this but you get the idea: Inconsistency brings confusion. Incidentally, if you’re tired, fed up or having a bad day, you absolutely must apply your rules in the same way as ever, regardless. Good leaders in our world are like this too – you always know where you stand with them and that’s a good feeling. It makes sense, doesn’t it? So there you have it, if you can avoid these common dog training mistakes, you’re off to a great start. 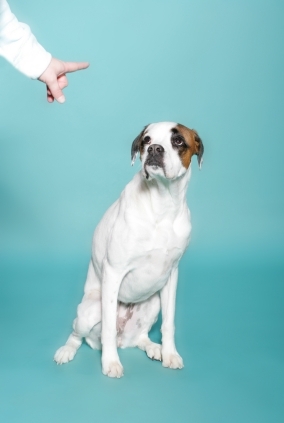 Dog training and dog psychology isn’t hard to get your head around if it’s explained properly. Clients are always telling me that it’s all really obvious once you know how. I love to hear that – I’m a big fan of the common sense approach! If you’d like to hear how I can help with a dog behaviour problem – or how to avoid one – please contact me. For more free articles and tips exclusive to this website, click here!